The entrance of this house is on Via dell'Abbondanza. It was attributed to Loreius Tiburtinus or to Decimus Ottavius Quartio, whose seal was found here. There is an elegant hall opening on the garden that is decorated with friezes portraying the expeditions against Troy: the larger one on top portrays the mythical expedition of Heracles against Laomedon, while the smaller one at the bottom portrays the historical expedition of the Greeks against Priam. The owner had himself portrayed on a wall of the house bald and dressed in a long linen-tunic like a priest of Isis (linigerus calvus). Furthermore, he ordered the building of a long (50 m.) bathing-pool in his garden. The pool had the shape of a river (eurípus) and was decorated with ancient Egyptian statues (ibis, sphinxes, lions, etc.). Thus, it is assumed that people initiated to the mysteries of Isis used to meet there to attend artificial floodings of the garden that simulated the sacred and fertile floods of the Nile. This house essentially is built around the garden. On the bottom wall there is a painting portraying the birth of Venus from a shell in the company of little cupids. Her hairstyle follows the fashion popular during Nero's reign. A statue of Mars and marble basins with doves are also painted. The building was still under restoration because of the damages caused by the earthquake as can be seen by the fact that a room had been whitewashed but not yet painted. ​This house was excavated in the 18th. century and brought completely to light in the years 1952 - 1953. There is a big and elegant garden with a portico supported by little marble pillars. At the center there was a summer dining-room (triclinium) with marble beds and a fountain with a waterfall. A second entrance led into the bathroom (balneum). An announcement on its door states that it could be rented with part of the house: "Julia Felix daughter of Spurius, rents to respectable people an elegant bathroom worthy of Venus, a workshop with apartment on the upper floor and mezzanine from the first of August. The lease will expire in five years". Evidently Julia, who was of a noble and rich family, didn't hesitate to sublet part of her house to make up for the restoration costs of the building after the earthquake of 62 A.D. A painting of Apollo and the Muses is in the Louvre in Paris today, while the other paintings are all at the National Archeological Museum of Naples. The amphitheater of Pompeii is the oldest of those we know from the Roman world. It was built after the foundation of the settlement (80 B.C.) by order of the mayors Gaius Quintius Valgus and Marcus Porcius, those who also ordered the construction of the Odéion. After the earthquake it was restored by order of the mayors Gaius and Cuspius Pansa, father and son. The building was erected in a peripheral area to avoid traffic jams in the city on the occasion of shows. The monumental stairs on the outside lead to the cavea with the spectators' seats. It could hold up to 20,000 spectators. The main part of the steps and of the upper balcony reserved for women is still intact. The level of the arena is lower than the outside area. This means that the theater was partly built upwards and partly set into the ground like the Coliseum. Fights between gladiators used to take place inside the arena. The games were opened by a solemn parade. The wrestlers wore heavy and completely decorated parade armours, helmets, dagger, shields and jambs. In 59 A.D. the spectators' enthusiasm led to a bloody brawl between the supporters of Pompeii and those of Nuceria. The event was “photographed” in a famous Pompeian painting. After the riots, Rome's Senate inflicted a ten-years “disqualification” on Pompeii's arena, but the measure was withdrawn in 62 A.D. because the earthquake had severely hit all citizens. Most of the gladiatorial arms, exhibited at the National Archeological Museum of Naples, were found in the theaters' foyer, used as the Gladiators' Barracks during the last years of the city. It is often called Large Palæstra to distinguish it from the Samnite gymnasium. It consists of an open square (approximately 140 x 140 m.) surrounded by porticos. Double rows of plane-trees were planted in the area; today it is still possible to see their casts. At the center there is a bathing-pool (natatio, 23 x 35 m.). The outer wall was crowned with merlons. The gymnasium was built near the Amphitheater during the Augustan period and was used both for the exercises of the gladiators and as a meeting-place for youth associations (Juventus Pompeiana) in order to educate them to the imperial ideology. Parades on foot and on horseback, battle simulations, duels, discus throwing and weight-jumping took place inside the gymnasium. The entire wall on the northern side collapsed during the earthquake of 62, A.D. 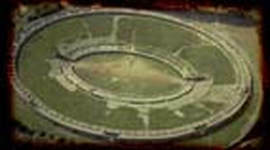 It was excavated in the years 1936 and 1951. Pompeii had its graveyards (necropolis) outside the city walls. The Necropolis of the Nuceria Gate spreads out along the east-west road that stretches parallell to the city walls. About 250 meters have already been unearthed. An inscription of Suedius Clemens lies a hundred paces away from the gate. He was the imperial prefect that after the earthquake expropriated the private houses built on public ground. The graves are of several types: with a base underlying the altar; in the shape of a sepulchral chamber with niches; in the form of a mausoleum with one or more rows; in the shape of a small temple on a podium; in the form of a semicircular seat (schola). The common funeral rite was that of cremation.